Fast turnaround and quality service since 2006. Located in Pemberton BC, Sea to Sky country, Limelight screen printing has been an established printing, embroidery and design service for over 13 years. With a diverse and loyal clientele ranging from ski and snowboard brands, to bike companies, yoga studios, events and many, many other small businesses that make this region so amazing! We offer a variety of inks, including water-based and plastisol, as well as foil and metallics. We provide high quality work, with top notch customer service, proven by a loyal customer base of repeat clients. Request your quote today! Screen printing is where we can turn your idea into a reality. Whether it's promoting your company or creating a brand that will be recognizable, screen printing is one of the most affordable and effective ways to reach a large audience. Generally you will pick your blank good(s) and then email us with your logo or graphic and we will quote you the cost per item. You can also schedule an appointment to visit our shop and order directly with us. Embroidery is a professional looking and classic way to make promotional wear and accessories stand out, yet still look simple and clean. 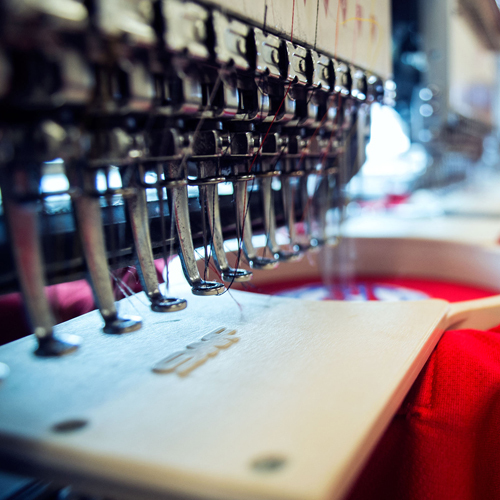 Embroidery requires your logo to be digitized into a format for stitching onto the blank good(s) you chose, ie. hats, jackets, shirts etc. We will do this for you and will also provide digital proofs of what it is going to look like once you have chosen the items and supplied us with your logo or design. Don't have a design? See right for details on how we can help. Do you want to print some t-shirts but need a new logo? Maybe you have an existing design but aren't quite sure how to turn it into something that can be screen printed or embroidered? We have helped many clients develop a logo or design that can be printed onto t-shirts, or embroidered onto hats or jackets. With our experience and creative skills, we will help you create something that looks great and stands out to give a bold impression. We work with these brands and many more. Limelight Screen Printing has been In operation from 2006-2019. Located in Pemberton, BC CANADA. Proudly serving the Sea to Sky Corridor. Tel: 604.894.1426.